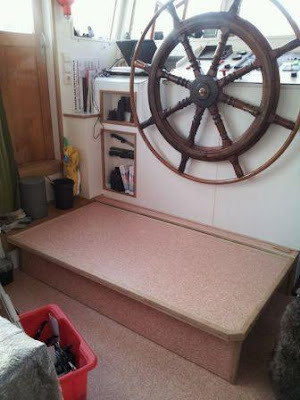 We left Haarlem on March, 19th to the start of a new barging season. We left earlier than last year because we will go to Groningen first to go into dry-dock and to do a bit of work on the hull. After six stationary months we left, neighbours waving us goodbye – we are settled in Haarlem – on a beautiful, sunny spring day. 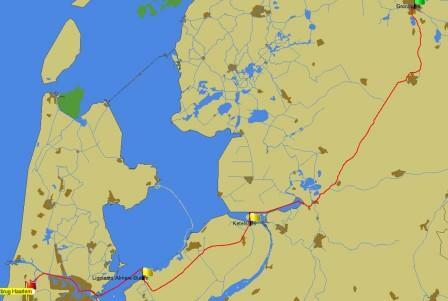 Our plans originally were to go North via the Randmeren, but at the last moment – going down the North Sea Canal (Noordzee kanaal) we decided to go to the Flevo-polder, first cruising the Markermeer and entering a lock near Almere. The weather was very calm, so crossing the Markermeer was no problem. We will do the Randmeren on the way back as we go to Amersfoort. But first we cruised the IJ, passing the newly built Film Museum and the Central Station, feeling Amsterdamers again. 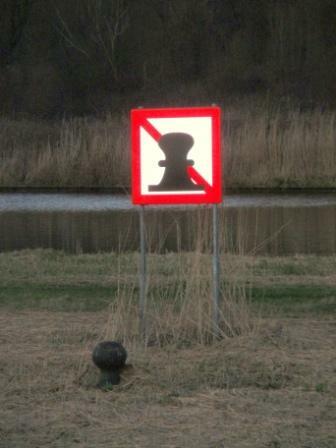 The welcome in the Flevo-polder was a bit confusing as at the first opportunity for mooring we came across this sign. But, no problem, cruise a bit further and we spent the night in the Noorderplassen, pitch dark, very quiet and heaps of stars. Really no comparison to Haarlem. What to say about the Flevo-polder, it really is a polder, flat, rather barren, windmills and the A6 highway all over as background. But also vista’s, beautiful skies, remarkable architecture in Almere, Easter eggs on the bank and nature reserves like the Oostvaardersplassen and the park near Lelystad. But also vista’s, beautiful skies, remarkable architecture in Almere, a kind of "Easter eggs" on the bank and nature reserves like the Oostvaardersplassen and the park near Lelystad. This picture shows the water level of the former Zuiderzee – now IJsselmeer, we did go down some 6 meters when entering the polder. Like the Schokland harbour in the midst of pastures we came upon the remains of a ships wreck, a 17th century fishing boat in the middle of this wood. After the drainage the wreck became visible because of the surrounding land going down as a consequence of lowering the water level. The wreck was now drying and exposed to the air it was a feast for fungi. They made a very ingenious construction, covering the wreck with earth, having an underlayment of plastic sheeting and now the wood is wetted by rain and conserved in a kind of tumulus. We left the Flevo-polder through the Ketellock and then cruised the Keteldiep, the Ramsdiep and the Zwarte Water (Black Water) and via Zwartsluis to Meppel. There we were entering well known territory because we cruised the Drentsche Hoofdvaart in 2010, when going from Groningen to Meppel. All the more fun because we knew that Smilde offers very good French fries! We are the first ship to cruise the canal this season, very quiet and nowhere we had to wait as the man who operates the locks and bridges accompanies you all along this stretch. As you can see the locals are well prepared for a season of barge watching. After another good winter in Haarlem we start travelling again today, a new season and new adventures. We start a route that we do not know, so far we came in and left Haarlem from the south side, now we are going North and through the North Sea Canal and the Orange locks to the Randmeren (all of our plans can be found on the web site) and all the way to Groningen, more about this in following blogs. 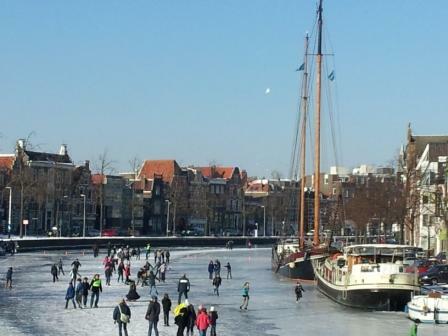 We have, in the end, had real winter and the Spaarne was fully frozen over. A lot of skating around the ship good for pretty pictures. 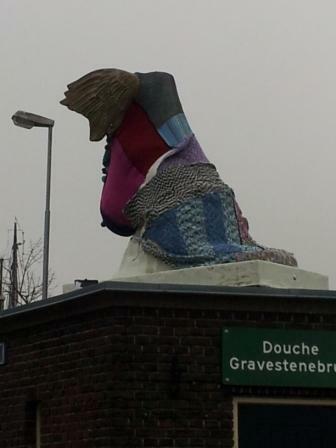 Although the winter is really is over now, Apollo's foot, standing on the shower building in the centre of Haarlem is still dressed with the sock a creative knitter has put on it, it looks cute. This winter again a lot of work was done in and around the ship. The biggest eye catcher is the new (collapsible) platform Michel build in front of the steering wheel, in any case, whatever we will have good visibility.